This well ventilated installation (described as “thought provoking” but what the provoked thoughts might be I leave to your imagination) is the latest in the seemingly never ending Year of Cultural Largesse. It does have one good thing going for it: It’ll be gone by next year. 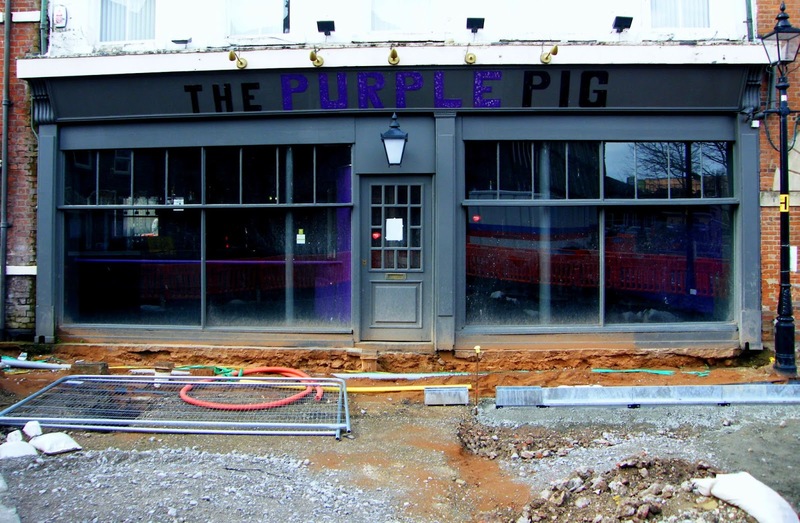 The oddly named Purple Pig restaurant on Trinity Square went belly up last October when the company that owned it put itself into liquidation. A nearby planning sign indicates that it is to reopen as a pub and further research tells me that the pub will be called “The Head of Steam” (*sigh* Pubs used to have such quaint names as the King’s Head, the Red Lion or even the Drunken Duck; now all pubs in a chain have the same name). The new owners are Cameron’s Brewery from my old home town, Hartlepool, so it’s bound to be a great place. I just hope access is restored to these premises as, at the moment, it’s just a bit tricky …. 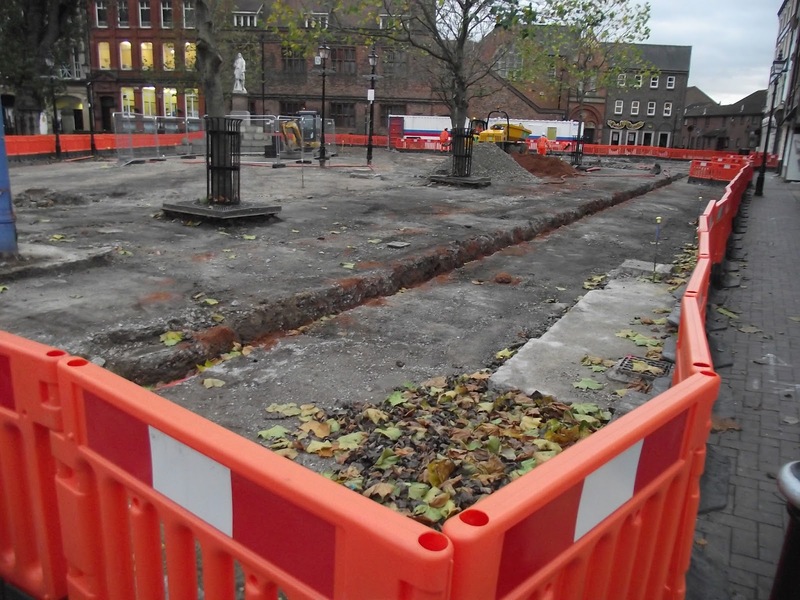 Here’s a rather (too) large panorama of Trinity Square showing the work (ha!) in progress. Andrew Marvell has long gone, the church wall is history as is the large tree that stood on the right of the doorway and those uneven paving slabs of the church yards are probably in somebody’s garden as I write. 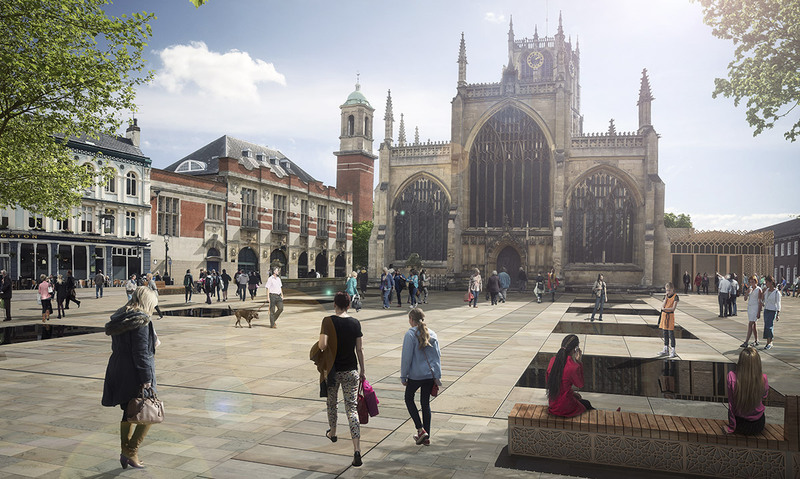 The good news is that the awful Trinity Square layout with its ridiculous seating and tedious brick paving are also gone. Also, in October last year, plans to build a lean-to restaurant up against the church exterior were shelved due to lack of funds; yet another of those things that were planned but are now (thankfully) not going to happen. 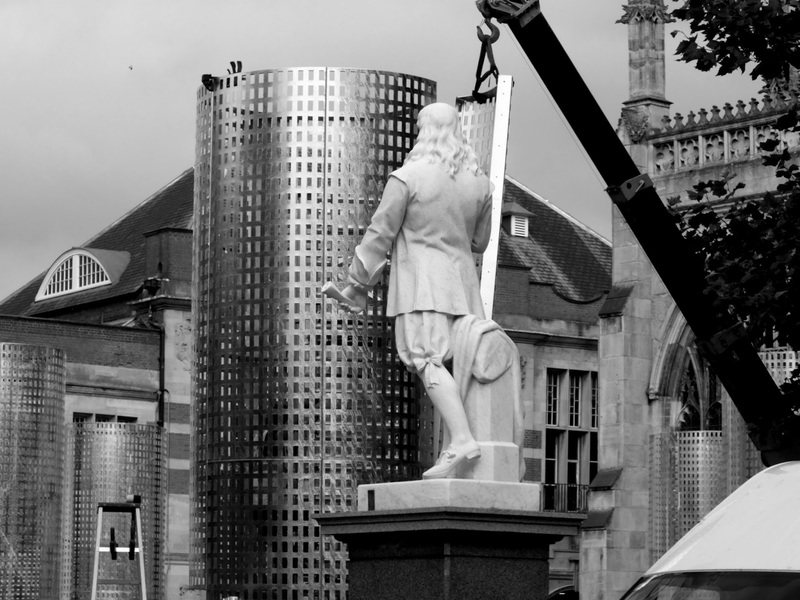 Now as far as I can tell the plan is to install something like the image below which I’ve borrowed from the council’s public realm document. I leave it to you to imagine how it will actually look. There seems to be only the vaguest of ideas as to what use this space will be put, cafés and seating and ‘events’ are mentioned but I don’t see that being much different from the present use and that is spectacularly hopeless. If this were any other cathedral city, and let’s admit that church is almost as big as a cathedral, it would be surrounded by a cathedral close with many tourist attractions, little stalls, entertainers; something to keep people interested. 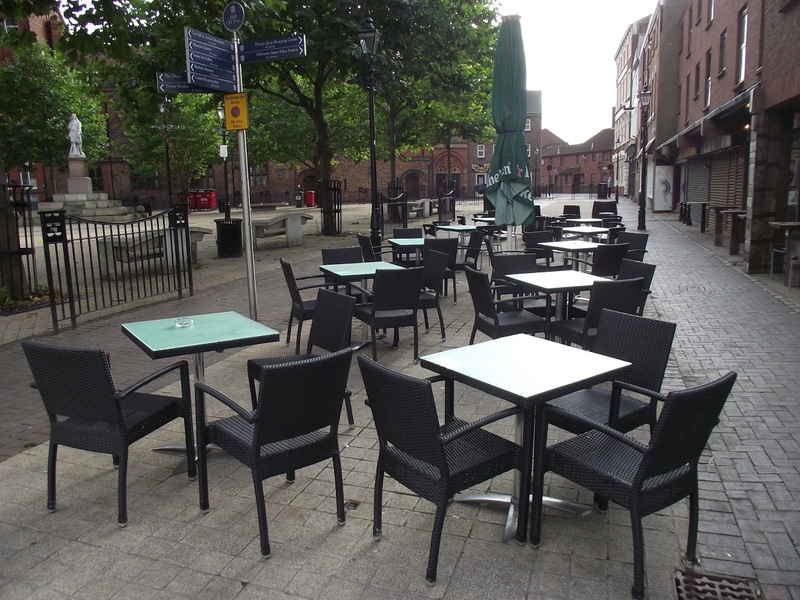 Here we get the same old “Seating will be installed and again pavement cafes will be encouraged ” Pathetic! I doubt that after the initial interest has waned there will ever be that many people in Trinity Square, the odd stray duck perhaps, sitting in those silly little ponds. If orange is not your colour then I suggest staying away from Hull centre for the duration of the ongoing ‘upgrade’. 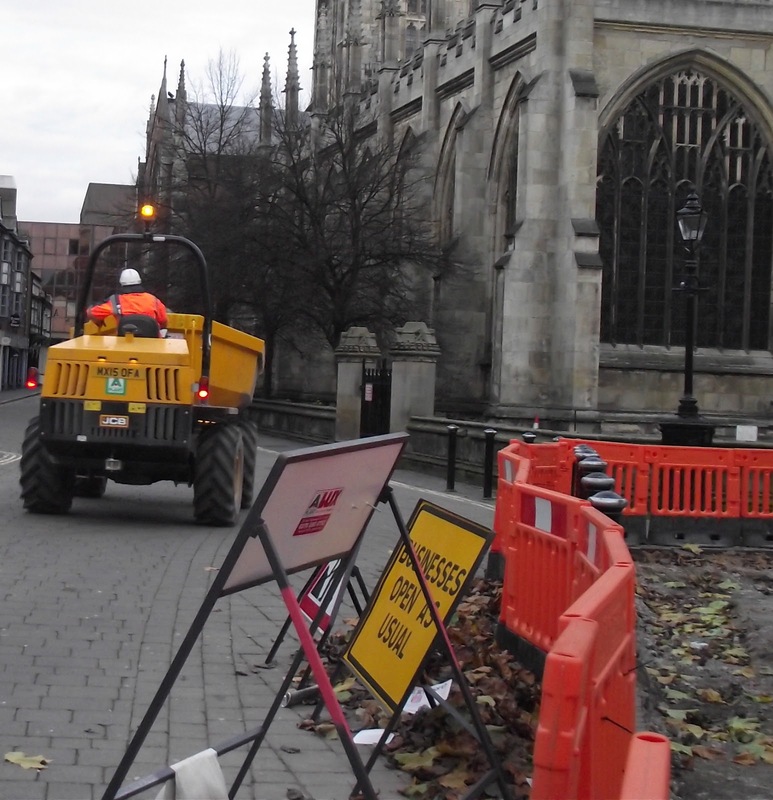 Just about every public space is lined with thousands of these barriers to protect us from the predations of JCBs and dumper trucks. Above Trinity Square looks like some sort of industrialised archaeological dig or perhaps a post-nuclear clear up that’s gone badly wrong. A sign nearby informs the passers-by (that would be me as I saw no other souls around) that the nearby cafés were open as usual. Well no! Below is ‘usual’; above is how a Council puts businesses out of business in the name of ‘progress’ which could be what they meant by business as usual.